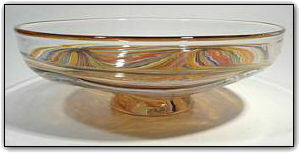 This colorful low bowl features rich golds, reds, blues, greens, and many shades in between. At the top is a band of elegant clear glass and this bowl sits atop an elegantly sculpted pedestal on the bottom. Make sure to zoom in and see all of the different angles, both the interior and exterior are absolutely gorgeous!